Consistent with how we treat other Open Graph object types, we’ve introduced the ability to see articles shared by your friends in the search typeahead. For instance, if your friend clicks ‘Like’ on an article at a news site, the article will appear in your News Feed and can now also surface in the search type ahead. This means that content that shows up in Facebook searches will be biased towards those items with more ‘Likes’ than others. So, what does this mean for brands? Well, clearly the more valuable your content to your readers, the more likelihood of ‘Likes’ and thereby featuring in search results and greater visibility. This is just the start of course: consider the implications of search results in a wider context and you are starting to get the picture. To discuss further in relation to your brand, please do get in touch. The work recently carried out to completely revamp the Helen & Douglas House website has been recognised in the annual International WebAwards with a Non-Profit Standard of Excellence WebAward for Outstanding Achievement in Web Development. The work involved a competitive pitch for the project, followed by a complete rebuild of the site’s CMS including custom online shop and social media developments. See the WebAward winners’ page here. About the WebAwards: Since 1997, the Web Marketing Association’s annual WebAward Competition has been setting the standard of excellence for Website development. Independent expert judges from around the world review sites in 96 industries. The best are recognized with a WebAward which helps interactive professionals promote themselves, their companies, and their best work to the outside world. 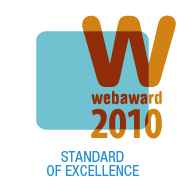 The WebAward Competition is the premier award recognition program for Web developers and marketers worldwide. I have already been asked a few times about Facebook Places, so it’s time to show everyone what it’s all about and the easiest way is to demonstrate using the new service that launched in the UK last week. So what is Facebook Places exactly? Places is Facebook’s equivalent of Foursquare or Rummble, that allows you to see where your friends may be and to share your location with them. You can see if your friends are nearby and connect with them easily and serendipitously. However you do have control over your visibility so you shouldn’t be too alarmed by the potential risks that location based services provide. 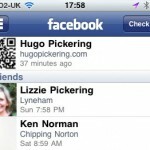 Firstly, you will need a smartphone (iPhone using the Facebook for iPhone app or Other web-enabled mobile device using http://touch.facebook.com/) in order to be able to check-in at locations as this is a mobile application after all. Click the ‘Places’ icon (it looks like the one on the top right of this blog entry) on the app’s dashboard and you will be presented with a screen showing your own location and those of your friends who are using Places. 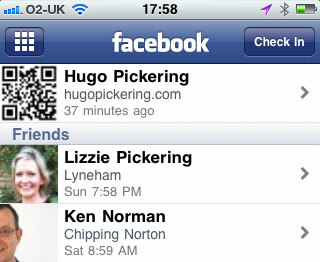 Then click on ‘Check In’ to see any listed ‘Nearby Places’. If your business is listed you can select it and check-in to the location, which will update your Facebook status to show that you are out and about and where your friends might be able to find you. If you don’t see your business you should add it so that you can check-in and others can find you when they search locally. 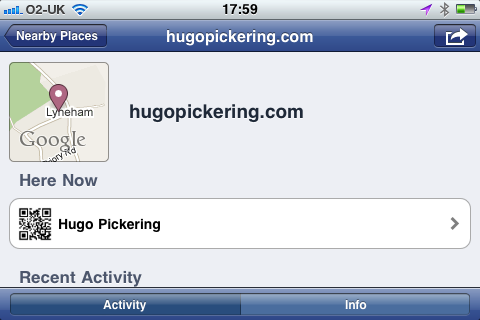 Click the + sign and you can create a new Facebook Place. 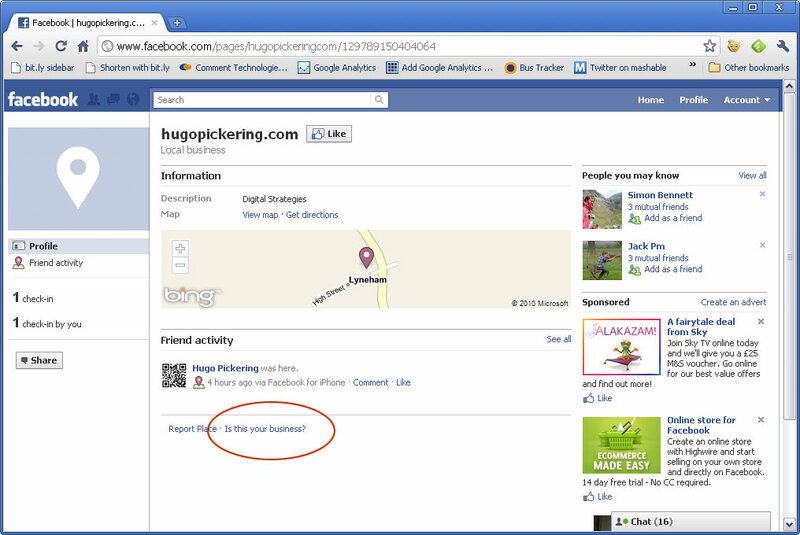 If this is your own business and you can prove it, you can then claim it as such (firstly check-in and tell everyone what you are up to) and go to Facebook on your desktop computer. There you will have to prove that you are legitimately claiming the location by selecting the Place in your status and then selecting ‘Is this your business’ at the bottom of the page (see below). 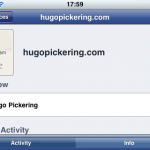 You will then be asked if you are the official representative and you will need to prove this by uploading a phone bill and associating an email with your Facebook account that ties you to the Place (a domain that is related, such as hugopickering.com in the example I have shown here). Once you have claimed your Facebook Place as your own you can really get a community started, allowing your friends, customers and community to tag your location and meet each other there.